Constructed more than a century ago, the Coburn Free Library boasts architectural details that are only found in historic buildings. 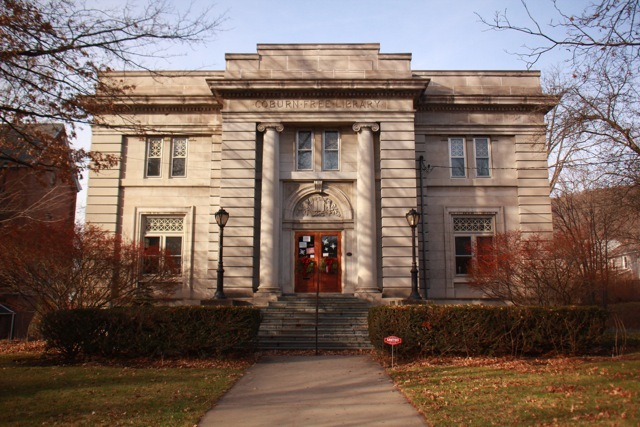 The Coburn Free Library opened in 1912 and quickly became a magnet for readers in Owego, New York and beyond. Library founders Andrew Coburn and Frederick Hewitt sought to create an extensive reading collection that was accessible to the public. They also forged a warm relationship with the Owego schools (today, the Owego-Apalachin School District), and that relationship still exists to this day. 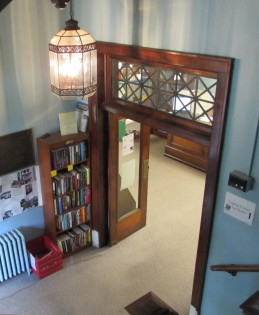 In addition, the library became an important repository for historical and genealogical documents, a complement to the collection housed at the Tioga County Historical Society. Today, as other forms of media rival the print materials Coburn and Hewitt loved, the Coburn Free Library keeps up with the times. Public-access computers, e-book downloads, audiobooks and wifi stand proudly alongside our ever-expanding print collection. There’s something for everyone at the Coburn Free Library! In the early twentieth century, many people contributed to the development of the Coburn Free Library. Some of them are profiled below. Frederick C. Hewitt (b 10/25/1839; d 8/30/1908), the wealthiest resident of Tioga County at the time of his death, left $30,000 to the Coburn Free Library. This was used to buy a lot on Main Street and to begin the construction of the library. Lucius Ford (b 3/23/1844; d 9/24/1911) at the time of his death was completing the handsome structure that presently houses the Coburn Free Library. Ford was a successful contractor and builder. Charles Dinsmore Marvin served as Director of the Chamber of Commerce and Village Mayor. Marvin Park, Draper Park, and Ahwaga Park were acquired by the Village while Marvin was Mayor. He left a bequest to the Coburn Free Library. Anna H. Marvin donated many books during her lifetime, and after her death a generous bequest was made to the library. Charles C. Ely (d 1928) was a donor to the Endowment Fund for the Coburn Library, leaving $20,000. Volumes of his poetry are still housed in the library today. George T. Stebbins of New York City bequeathed $3,000 to the library. The Hiawatha Club, a literary group organized in January 1905, held fundraisers such as fairs and festivals, raising $1,000 for the library. Women’s Clubs of Owego donated $1,000. This was used for furniture and the piano for the assembly room. Bishop William A. Leonard, a genealogy enthusiast, left his private collection and diaries to the Coburn Library. Fred W. Clifford (b 6/27/1867; d 1/31/1931) practiced law in Owego, and upon his death bequeathed a substantial sum as an endowment to the library. Marian Wickwire gave an endowment in memory of her mother, Cynthia Cornell Goodrich. Mrs. Wickwire’s daughter Cynthia unveiled the memorial tablet at the time it was dedicated. Louis D. Hyde (b 1871; d 1957), a local ophthalmologist, created a foundation with his wife Fannie that continues to fund the cultural enrichment of the village. Would You Like to be Part of our History? Here’s your chance! We are in the middle of a capital campaign to raise money for a new handicapped-accessible entrance, restroom, and elevator. With an undertaking of this size, we’ll need all the help we can get! We also, as a non-profit, need general fund contributions to continue providing quality services to our community. Please donate to keep this beautiful, village library open as a beacon for education in the community for generations to come.